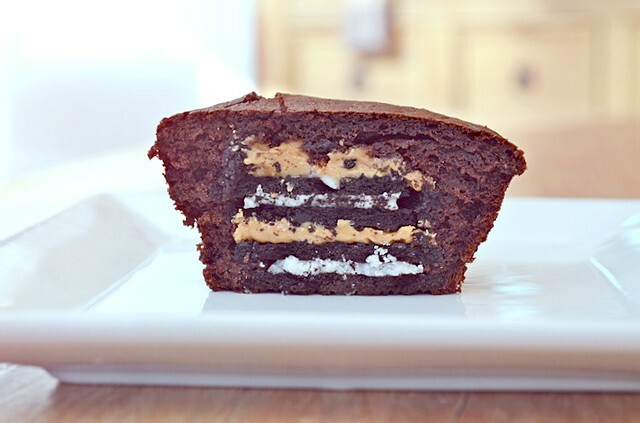 Moist gooey chocolate cake, smooth peanut butter and a double helping of oreos? It doesn’t get much better than that ..drool. I spotted this recipe online (recipe snobs, I think!) but with brownie mix. I only had a packet of chocolate cake mix in the cupboard so I decided to change it to a chocolate muffin recipe instead. I definitely wasn’t disappointed with the results.. Talk about a chocolate peanut butter party in my mouth. 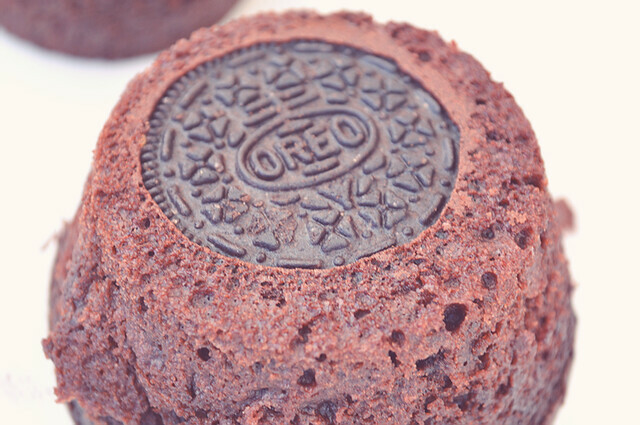 Pre-heat the oven to 180 in the mean time Mix the chocolate cake mix, 3 medium sized eggs, 250ml of water, 90ml of vegetable oil in a bowl and whisk until the mixture is nice and smooth..
Place the oreo stacks into a baking tray and cover with chocolate cake mix. I found it was easier to cover the sides of the oreos first to make sure their completely covered! Pop them in the over for around 20 minutes and wait..
Now you should have 6 light and fluffy chocolate muffins (with a hidden surprise) after leaving them to cool turn them over and they should look something like this..
Best served whilst still slightly warm and gooey with a nice cold glass of milk, enjoy! Oh gosh now my mouth is watering! Go away diet..I think I may have to make these! YUM this looks so yummy 😀 Calory bombs though hahaha but oh well we don't care! Oh my god these look like heaven. What an amazing cupcake, I need to try this out. I am literally drooling at my desk right now, these look AMAZING. These look amazing! My mouth is watering just looking at them! This is such a clever idea! I was hoping to do some baking today, I just might try this one out. I'm not sure the oreo stack covered in peanut butter would last long enough to make it into the cake! Oh wow, that looks absolutely gorgeous. Tempted to try and bake this myself. 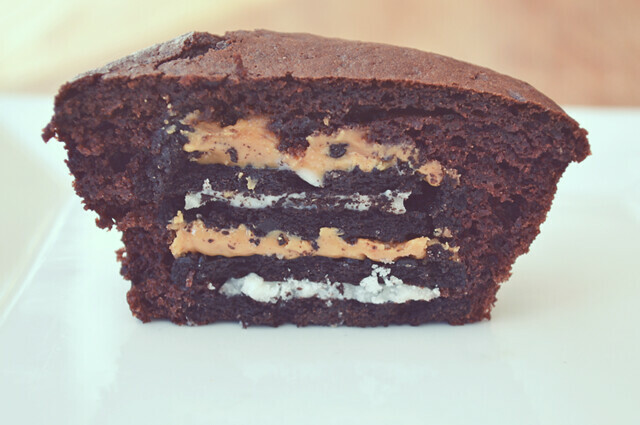 Omg I need to make this, I'm drooling!! Oh my!! That looks like heaven, must make it! Those looks so tummy I remembered that I have cake mix in the cabinet and some Oreos I hid so this would be perfect to try! These look delicious! Definitely know what i'm going to be baking Saturday! genius idea! need to try these out!! oh my god. these are unreal! they look so incredible! Wow need to make these this week. Thanks for the recipe. Oh my days this looks heavenly – my mouth is watering lol! 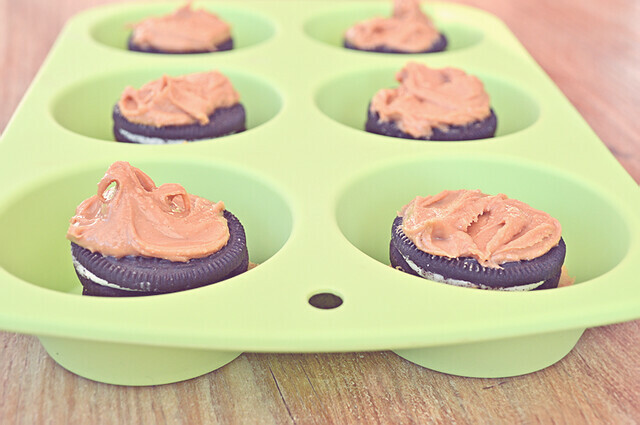 These look ridiculously delicious…i need to make them immediately! These look oh-so-heavenly! Will deffos be trying them soon! 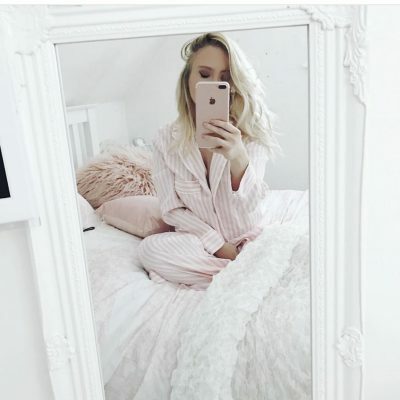 I love the idea of these! My boyfriend loves them all so I may make them into cupcakes for his birthday 🙂 thank-you for sharing! 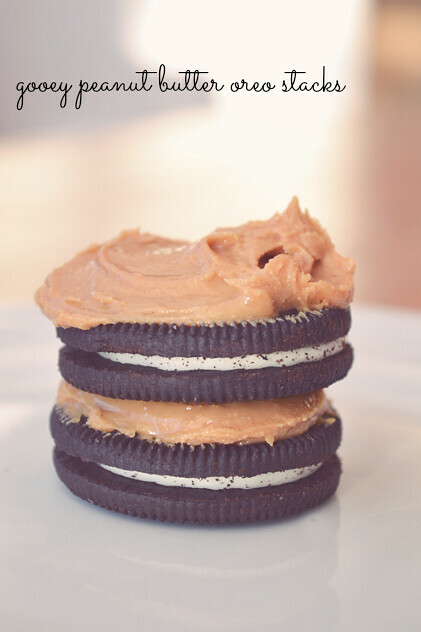 3 of my favorite ingredients in one: chocolate, oreos and peanut butter. Delicious! This looks amazing! I can just imagine tasting them! OMG this is literally a combination of my favourite foods :0! When I saw these flash up on 'Blog Lovin' I thought 'Ahhhh I'll look at these and day dream about them all afternoon'.. Shock horror I saw how easy they are to make..
Woah, these look amazing! 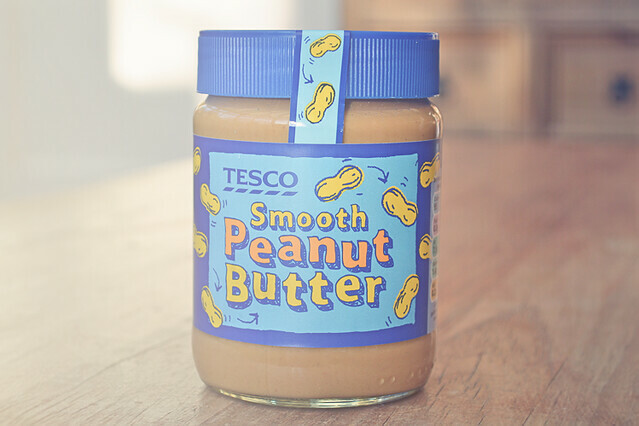 I'm such a peanut butter prostitute! 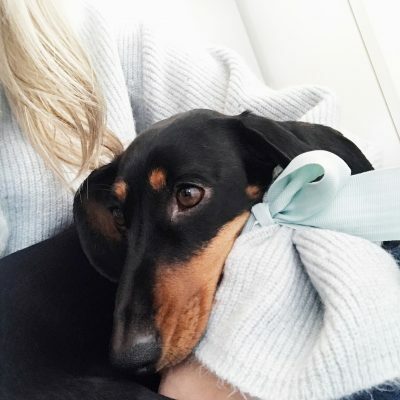 Oh my goodness, you haven't yet posted up a recipe without making me extremely hungry, this looks so darn good I might just have to give it a go, yum! wow it looks so delicious!! I'm super excited to try these, they look AMAZING! Wow, this looks amazing! My diet might hate me if I made this though! OMG, I love chocolat ! Oh my god, these look unreal!